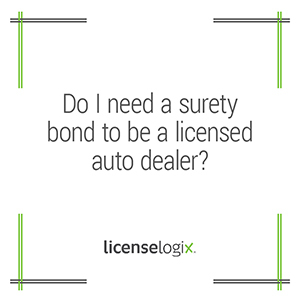 Are licensed auto dealers required to get surety bond? Government agencies require business owners in certain industries to purchase bonds before they allow a business to receive a license. This is because these agencies have an interest in protecting consumers and bonding is a way to guarantee a business adheres to the laws. LicenseLogix helps companies in all industries determine what licenses they need, manages the license application process, and ensures ongoing license compliance. As part of this process we will let you know if your particular industry and licensing agency requires a bond. We have relationships with licensed surety bond companies and can help you to obtain your bond through a simple and streamlined process that will ensure your license application goes through without any problems. For more information about the surety bond process, what business licensing services we offer and how you can get started with your license application today, contact us by clicking live chat, or you can submit a question, or simply call us at (800) 292-0909.